For my nieces', nephews', and close friends' 6th birthdays, I make small tooth pillows. I ask their favorite colors, and it's nearly always pink and purple for the girls, and red and/or blue for the boys. You will need two 7 1/2 X 9 inch pieces for the pillow. I use solid color fabric scraps and some printed dental smock fabric with pictures of teeth, and with words like, "brush, floss, etc. ", which I found on eBay. On the front, I embroider "My Tooth Pillow" and the name, using a large font (Hog Bold works) that I trace on the fabric. Over the years, I've also used fabric paint; you can get as creative as you like. I use the printed fabric on the back, but it could be a coordinating fabric. Mattress ticking is nice for boys. I make a small pocket with a snap closure for the tooth (and the money) and sew that to the front. The pocket is made from one 3 x 7 inch rectangle. These pictures are of the latest one I did. I crocheted the lace edging and wove rickrack through the openings. 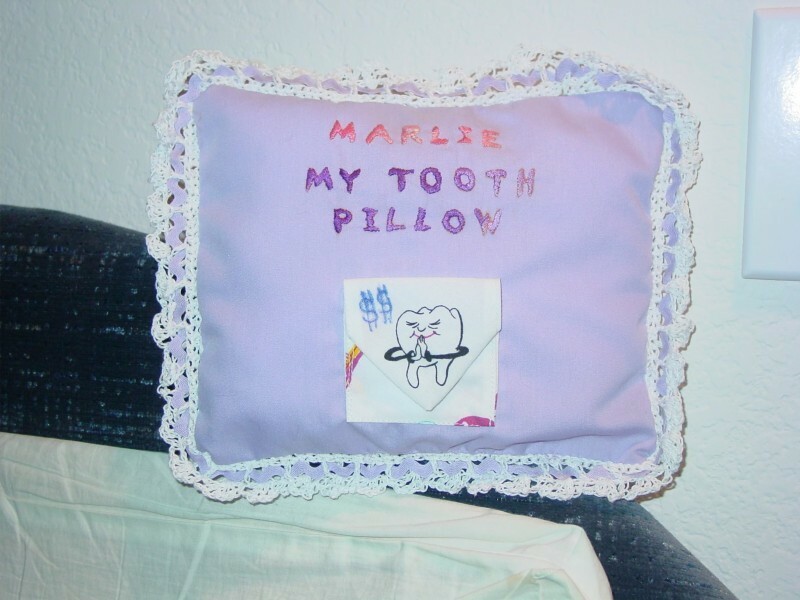 It makes it much easier for the tooth fairy to find those tiny teeth without rooting around under a big pillow, and so far, every child I've done one for has loved it. Yield: Depends on how much scrap fabric you've got stashed. Source: Very old Redbook magazine from over 40 years ago. For pocket, turn under 1/4 inch along both long edges and one short edge and press. With right sides facing, fold lengthwise in half and stitch across unpressed end, (1/4 inch seam), which will make a point. With wrong sides together, fold square end toward pointed end, 2 1/2 inches. 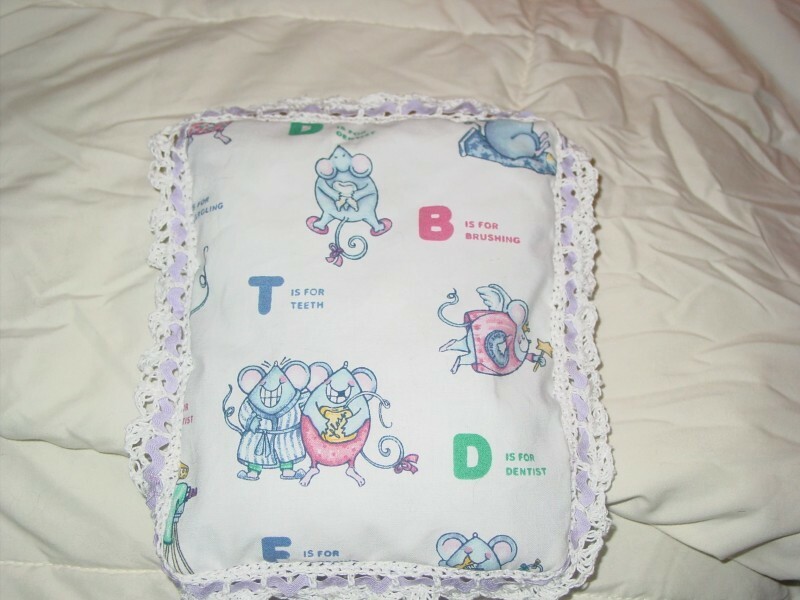 Embroider "My Tooth Pillow" and name on front, center, or put in the corner, whatever you like. Fold down flap of pocket and stitch pocket (around lower edge) to front of pillow, using Velcro or a small snap to hold the pocket shut. I put ruffles or lace around the edges and sew it all together, leaving an opening to stuff with fiber-fill, and then sew it closed. Add dollar signs to pocket, if you wish, using a Sharpie.